Starting this Thursday, February 23, Woodstock-based artist Devorah Sperber, who keeps a "large works studio" on Sterling Road in Saugerties, will be carefully shipping out 45,670 spools of different colored thread in a process as tightly coordinated and monitored as anything a government or business undertakes. They're part of two new commissions by the heralded artist who'll be the recipient of a major Brooklyn Museum retrospective, The Eye of the Artist: The Work of Devorah Sperber, next year at this time. 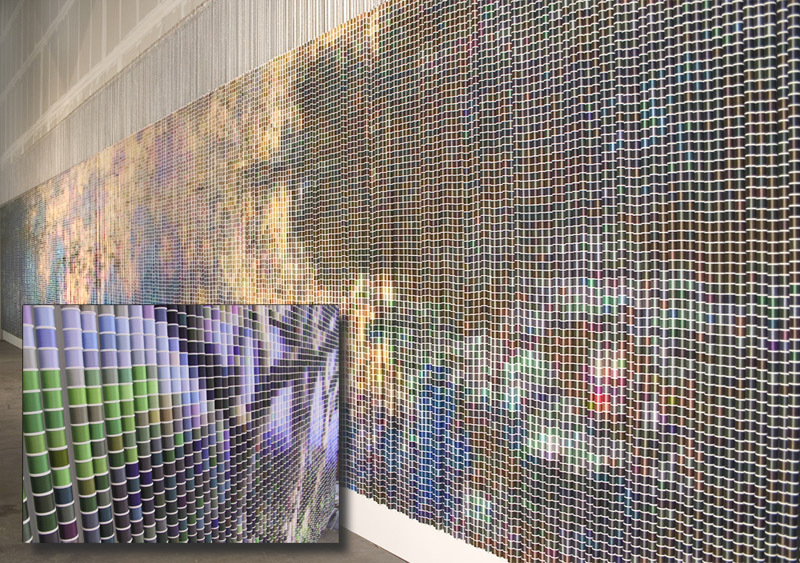 The major work of the two, "After Monet (Water Lilies), 2005-2006," comprised of 43,000 spools of thread, stainless steel ball chain and hanging apparatus and viewing mirrors mounted on the opposing wall, will be hung next month at the corporate offices of Wells Real Estate Funds in Arlington, VA. The other is a private landscape commission. In December 2004, Sperber completed a major 60,000 spool/23 convex mirror permanent installation for the Centro Medico Train Station in San Juan, Puerto Rico, that was commissioned by the Government of Puerto Rico. "I am interested in the link between art and technology, how the eyes prioritize, and reality as a subjective experience vs. an absolute truth," says the artist, who has also created visually complex yet classically-oriented optical works involving chenille stems, fiber rugs, map tacks and shower curtains. "As a visual artist, I cannot think of a topic more stimulating and yet so basic, than the act of seeing-how the human brain makes sense of the visual world." Sunday, February 19, Sperber invited friends and supporters, as well as those who have helped her with the gargantuan tasks involved in organizing her monumental art, for an Open House at the ultra-clean, excitingly charged studio on Sterling Road. All were not only amazed by the works, now shipped, but utterly charmed as well.